I may have been very keen on Thundercats, and probably consider it the better cartoon today, the cartoon I loved above all others as a young child was Transformers. There's a long list of cartoons I loved and will eventually revisit - MASK, Inspector Gadget, He-Man and She-Ra, plus all the home-grown cartoons like The Raggy Dolls, The Poddington Peas, The Family Ness, Trap Door, Stoppit and Tidyup and The Shoe People. And now that we're making a list I can't leave out the quirky Mysterious Cities of Gold - need to finish Season 2 soon - and its sister Ulysses 31. Or, indeed, that Betamax to the VHS of Transformers that is the Go-Bots. For all that I loved the Transformers, though, I can't say that these episodes of the very first season were familiar to me - and they deserve their reputation for being very low-quality in production terms. Of all the big 80s cartoons, only He-Man is this clunky. There are constant colouring errors, with characters that share very similar designs constantly being confused, layering errors and plain bad animation choices. Grimlock and Devastator have robot heads that keep changing. Thundercats had its iffy parts, but every episode of Transformers is stuffed full of them - something compounded by the DVD I was watching, from the Kid Rhino remasters, had gone back to pre-broadcast masters that contained even more animation errors than made it to the original airings, for the sake of better overall picture quality. Luckily, the latest DVDs from Shout! have mostly fixed these problems - but I don't have those. My Transformers is really the Transformers of the latter part of the second season and the movie - which I will still defend. I didn't see much of season 3 - I don't think it made it to terrestrial television in the UK, so what episodes I saw were bought on VHS. Similarly, I don't remember a this season either, with only Heavy Metal War as part of my modest video collection. My brother and I didn't know at the time that the Marvel Comics continuity was different from that of the cartoon, so until I rewatched these initial 16 episodes I thought the Dinobots were created to deal with Shockwave but trapped in a tar pit. That's only in the comics - here, they are simply built. If anyone asks about the later need for Vector Sigma to activate new Transformers, you either hand-wave frantically and talk about supercomputers being needed to make intelligent bots but regular ones being able to make simple-minded robots, or you just point to the numerous contradictions within the cartoon (just try to trace the Constricticons' origins) and run away. The fact is that Transformers is simply not well thought-out. The plots are clearly utterly thrown-together and often nonsensical. Reasons for the Decepticons retreating can be as simplistic as having some foam on them. In one episode, Skyfire is honoured as having sacrificed himself for the rest, and then after only a couple more, they dig him up when they need a lift and he's alive and well. The pilot episodes end with the Transformers preparing to return to Cybertron...and then they just pretend that never happened. Most egregiously of all, the show never gives adequate reason for the robots to ever need to transform, which is rather the key point of the whole series. Soundwave will turn into a tape player to sneak into a station...but the giant robots can just rip the walls apart and walk in anyway, so why bother? Why does Reflector need to change into a camera to look at a code when the robots all have these capacities in their eyes? There's a vague sense of powering up by transforming - the Dinobots' dinosaur forms are like heavy artillery, Megatron's entire form being a gun makes him more powerful than just using his fusion cannon, and the Autobots who for whatever reason cannot fly get places faster by being vehicles, but the premise is robots in disguise, and given that they do not fool one another and are so much stronger than the puny humans that they have no need whatsoever to fool them, there's never any call for a disguise. For this first season, I must say that I entirely sympathise with the critics who condemn the cartoon as a poorly-made excuse to sell toys. It's undeniable that this is not a cartoon made out of love for telling a story. A whole lot more effort could have been put into this. The times it looks awesome are far outweighed by the times it looks stupid, the human characters are all absurd - especially 'hacker' Chip Chase, who can somehow completely remote-control a super-advanced living robot on his 80s computer - and Megatron's vague plans to get 'energy' soon becomes bizarre, once he has access to Cybertron and could go and harvest energy anywhere. The cast is also plain outsized, so the likes of Skywarp, Blue Streak and Windcharger aren't exactly unique enough to be well-remembered. And yet - there is a certain sparkle here, and it's not just nostalgia talking. 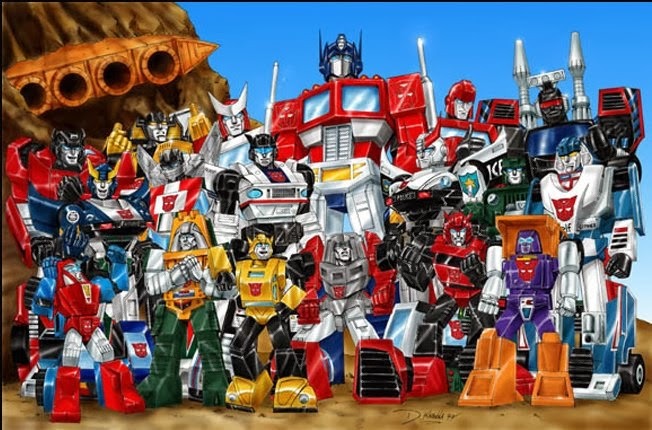 There's a reason Transformers excelled beyond various very similar franchises, and it wasn't just the marketing machine, which was also present with its competitors. Even if the series never really gets there with the explanations, the transforming robots thing still captures the imagination and the sound they made for it is perfect. And in common with the Go-Bots and Thundercats - especially once the Lunataks arrived - one of the key factors to Transformers being compelling is that the bad guys are not just cackling maniacs, though Megatron is little more than this, with plenty of hubris. What is crucial, though, is that he is surrounded by such a colourful crew of fellow baddies - the hilarious Starscream, always trying to usurp Megatron and mocking him yet being entirely ineffectual, the hilariously deadpan Soundwave with his awesome shoulder bazooka, and his snappy little streetpunk tape Rumble, who I'm oddly glad became the nicer-looking blue robot despite the well-known controversy. Looking into the extant fandom I found lots of cutesy 'Daddy Soundwave' art, with Rumble and Frenzy as his badly-behaved kids and Ravage and Laserbeak his pets, something which has no more support in canon than Soundwave stroking Ravage in 'Heavy Metal War', but my god it plucked my heartstrings in a funny way. This first series was laying the groundwork for something better. In season 2, there would be a lot more development for the primary cast, the animation would gradually improve and the new characters would often add a lot to the dynamic of the teams rather than simply exist somewhere in the background. I still feel the Transformers series is defensible - even good. But that's with a few provisos, and one of those is that it isn't judged purely on its first series. Because much as I enjoy every episode, that's with a fair bit of cringing. A fair review, however Season 1 of Transformers for me has much more of a different tone to it than Season 2. In large parts of Season 1 the Autobots are completely outclassed by the Decepticons in full on combat even with the help of Optimus Prime. For example, in the 'More Than Meets The Eye' trilogy the Decepticons win every single fight the two sides have or at least achieve their goals of gathering energy before fleeing. And in one instance, 4 of them working together couldn't even keep Ravage captive for long. It is only through Mirage's invisibility trick that the Decepticons are defeated in the end not because good is strictly better than evil. As for 'Divide and Conquer' the Autobots without Prime are easily defeated and demoralised to the point where they are only kept going by Spike's rallying cries. Even when Skyfire and the Dinobots are introduced, you still get the feeling that the Autobots can only win if they out-think the Decepticons or if the Decepticons mess things up themselves - a theme which is much more in line with how the Movie plays out. There's also a story arc to this season compared with others as both sides add to their forces as new characters are introduced and both sides adapt slowly to life on Earth. Contrast this with Season 2 and there is a shift to a more episodic/character based feel where the episode order is much more interchangeable. The Autobots are much more evenly matched and generally can defeat the Decepticons in combat. Characters aren't introduced in logical sense like the Dinobots are, often just randomly appearing from nowhere - this is probably down to the huge increase in the number of episodes being made plus the Movie production going on in the background. Lastly, I must praise Transformers for giving Frank Welker (as well as many other west coast based voice actors) a great opportunity to show off the full range of his vocal talents. Excellent comment - I think there's a general trend in 80s cartoons of having the bad guys initially being threats that are very much equal to the heroes, only to gradually become weaker and weaker. It also happened to the Lunataks in Thundercats, who initially were even with them and eventually could be defeated en masse by any single Thundercat. On the other hand, the same can be said for the heroes, as the Dinobots soon fall from their position as stronger than any of the others. I think I'm in agreement all through my review that season 2 is pretty different from season 1 - as I say, this was groundwork for something better, though perhaps keeping the Decepticons more formidable would have been a good idea. The abiding impression I get, though, even here, is that the relative strength of each side is very much dependent on the needs of the story - if the Decepticons are getting the upper hand to provide tension, they may seem much stronger than if they are easily repelled at the end of the episode, often by nothing more than their initial plan going a bit wrong. It's a slight shame that (perhaps excluding the combiners and Omega Supreme) a lot of characters will start just showing up. I remember Beachcomber just coming from nowhere. But that was present here, too - Frenzy, for example, just shows up, and the Constructicons are just given a throwaway line about being built. I guess it's because the toy line massively increased. As for Frank Welker, the man is a legend. Whenever there's a scene with Megatron, Soundwave and Rumble it entertains me that they're all him. Though there's that one awkward moment where they forget to put the effect on for Soundwave and for a moment Dr Claw is in the cartoon.